The Texas Nurses Association (TNA) is pleased to support H.R. 379, the National Nurse Act of 2015. H.R. 379 would designate the same individual serving as the Chief Nurse Officer (CNO) of the Public Health Service as the National Nurse for Public Health. The TNA is the only full-service professional organization representing the interests of Texas’ 290,000 registered nurses. Our members serve in a variety of capacities, providing general and specialty care as registered nurses and advanced practice nurses (APRNs), a group that includes certified nurse midwives, certified registered nurse anesthetists, clinical nurse specialists and nurse practitioners. These nurses practice in a wide range of settings such as private practices, hospitals, and home health settings around Texas. Thank you for your leadership in raising the visibility of nurses. The TNA appreciates that H.R. 379 provides for elevation in rank for the CNO, includes a report to Congress on the Commissioned Corps Nursing Category, and achieves a stronger focus on the role of the CNO in advocating for programs that address the health care demands of our nation. We applaud the intention of H.R. 379 and look forward to working with you on legislation that strengthens America's health care system. 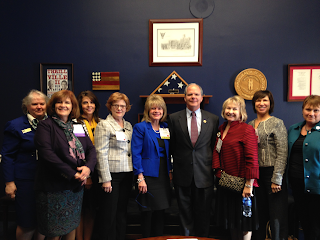 Earlier this year Deans of Nursing from Northern Kentucky University, Frontier Nursing University, Murray State University, Morehead State University, and University of Kentucky met with Representative Brett Guthrie (KY-2-R) in his Washington DC office to advocate for H.R. 379, The National Nurse Act of 2015. Personal contact via a face-to-face meeting with an elected official is a very effective way to gain their support. Meanwhile, students enrolled in the University of Texas Arlington graduate nursing program contacted the NNNO via the Contact Us form at http://nationalnurse.org. They are exploring current nursing legislation in their health policy and leadership course and decided to focus their group presentation on the National Nurse Act. Students plan an interactive class discussion and a letter writing campaign to many U.S. members of Congress representing districts in Texas. Those wishing to communicate their support for S. 1205 and H.R. 379 are using the template letter and phone script available on the Take Action Link. All of this activity is making a difference. If you are interested in meeting with your U.S. Representative or Senator to urge their co sponsorship for the National Nurse Act, please email the NNNO Board for materials and talking points. We are here to help make your request a success.